Welcome to Fiats latest small MPV. THERE IS NOT A SINGLE SHRED OF 500 DNA in the new 500L  I'm afraid this car is a 500 in name only. Fiat's last effort in this MPV arena was the utterly underwhelming Idea, but let's be clear from the outset: the 500L is a totally different beast. And it's got huge potential to be a winner. As its name suggests, this is a large car. Very large, in fact. It's actually three inches longer than a Punto, as wide as a VW Golf, and as tall as me. And it's also the first car in the Fiat Group to be based on Fiat's new 'B' platform, as opposed to the 'A' platform used by the 500 and Panda. On the evidence of my first drive, the prospects are rosy  the chassis is basically extremely competent. I'm quite surprised at how stiffly sprung the 500L is, but then it is intended as a load-lugger that might have to cope with heavy payloads. The stiff springing also helps keep body roll in check, and makes the cornering basically safe and secure, if not the last word in dynamic sharpness. The trade-off, though, is a ride quality that's quite jittery on most surfaces. The only engine available for test was the 105bhp 1.6 MultiJet diesel (other engines in the line-up are a new 105bhp version of the 0.9-litre TwinAir, an entry-level 95bhp 1.4 petrol, and an 85bhp 1.3 MultiJet). The 1.6 diesel has the best performance figures in the range (0-62mph in 11.3 seconds and 112mph top speed)  not exactly earth-shattering. And I do fear that some of the smaller-engined variants might feel underpowered. However, the strength of the 1.6 diesel is its torque  a huge 236lb ft at 1,750rpm  which gives it real oomph in every situation I tried. It's not the most refined diesel I've ever driven; but neither is it too intrusive. Clever glass sections in the A-pillars make visibility very good by class standards, aided by plenty of glass in the rear pillars, as well as a decent-sized tailgate window. Did you know that 74% of all small MPV buyers are aged over 60? Neither did I. But Fiat is very definitely gunning for the under-60s with the 500L. It sees the main rival as the MINI Countryman, whose buyer profile is considerably more youthful. Here's the evidence. Fiat has teamed up with Dr Dre to create a 500L-specific Beats sound system. Not many over-60s are going to tick that option box, methinks. Especially as the sub-woofer takes up the space normally occupied by the spare wheel. The styling is targeted at the younger buyer too, from the 500-inspired front-end to the contrasting roof colour options. Inside, the 500L looks equally funky, with intriguing rounded-off rectangle shapes for the dashboard and steering wheel. It's all clearly laid-out and easy to use, although the AirCon controls are a bit low down, and the frankly ridiculously oversized gear lever knob and handbrake feel more suited to lumberjacks than to lounge lizards. Every carmaker likes to boast about its superlatives or USPs. The 500L's are odder than most. For instance, it has more "chromatic couplings" than any other rival (that's paint options to you and me), the biggest glass roof in its class and  get this  it's the first car in the world to have an onboard coffee maker as an option (Lavazza, naturally). You want practicality? That's where the 500L's size really comes to the fore. There's masses of headroom front and rear, and equally generous legroom. The virtual absence of a centre tunnel makes the centre rear seat a more usable proposition than in most cars, although a lack of cabin width will make three adults in a row a real squeeze. The rear seats also recline, and can slide to liberate extra luggage space. Speaking of which, there's 400 litres with the rear seats in position (that's more than you'll find in a VW Golf) and an awful lot more after folding the seats. And that's a very straightforward operation  simply pressing a button virtually catapults the seats forward on their gas struts. Heaving them back into position presents more of a challenge for the muscles, though. 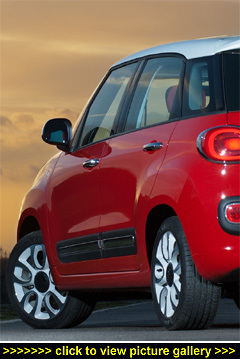 The 500L is in UK showrooms as of mid-March 2013. And it looks like it might be a hit, with 2,000 pre-orders from UK buyers in just three weeks of ordering. Prices start at �14,990, although Fiat quirkily claims that there's no entry-level 500L because the youth-vote Pop Star model and the plusher Easy are identically priced. The range-topping Lounge version adds extra equipment for a �1,200 premium.